Fixed dropdown menus on iPad. Updated Chosen.js to latest version. Added an option to hide your website before showing the verification screen. Fixed a bug that would prevent font-awesome.css from loading. Minor improvement to the UX. Minor bug fix from 1.3.14. Fixed a bug that could prevent scrolling on smaller screens. Fixed a bug related to single and double quotes in the Age Verifier’s screen content. Fixed a bug related to filters using tags. Fixed a bug related with HTML5 Local Storage. Fixed a bug related with HTML5 Local Storage, that would occur on browsers with disabled cookies. Added an option to change the background color while there is also a background image assigned. Fixed a bug that would occur when installing the plugin. Fixed a bug related to the HTML5 Local Storage fallback. Fixed a bug introduced in version 1.3.4. Several bugs related to JSON parsing have been fixed. Added HTML5 Local Storage as a fallback to cookies, in cases where cookies might not work properly. The plugin now detects search engine crawlers and doesn’t launch if the user agent is a crawler. Fixed a bug which prevented inserting HTML code in the screen’s content. Fixed a cookie related security issue. Fixed a bug that could cause the screen to appear to verified users. Added an option to choose an image as a background. Added an option to change the color of the text and some of the controls to complement the image background. Improved the appearance of the “birthday” form on mobile devices. Fixed a bug which prevented line breaks from appearing properly in the screen’s content. Fixed a bug which prevented cookies from saving when logged in as admin. Fixed a major bug that prevented cookies from working in a certain situations. Fixed an error that could cause special characters in the content to break the plugin. Added a “Home Page” filter. Added an option to change the text for the error message and the various controls of the screen. Added an option to redirect a user to a “safe” URL. Fixed a bug that would prevent the bug from installing on some versions of PHP. 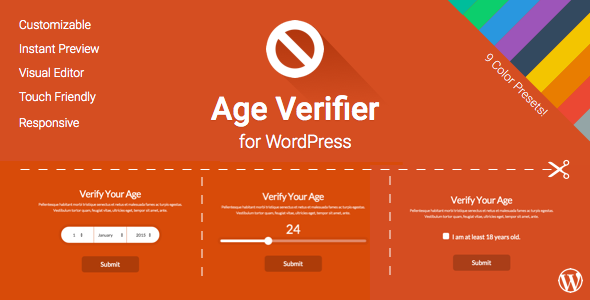 Added functionality to be able to choose on which pages or posts to display the age verification screen. Improved the layout of the Editor.